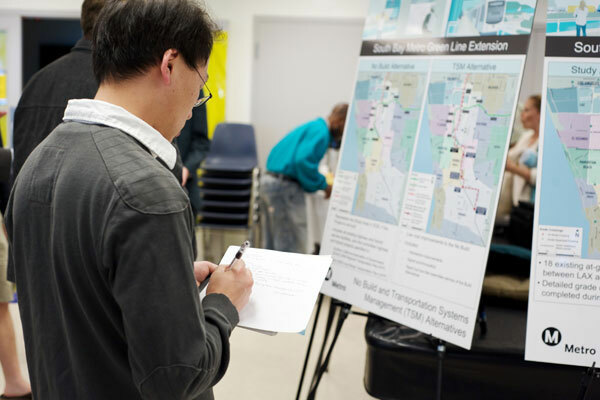 The Green Line Extension to Torrance Project is studying passenger transit service options along a four-mile segment of the Harbor Subdivision Corridor from the existing Redondo Beach Marine Station to the proposed Regional Transit Center (RTC) in Torrance. The extension will be served by the Metro Green and Crenshaw/LAX Lines. This extension will provide congestion relief along the busy I-405 corridor. It will also improve mobility in southwestern LA County by accessing the regional rail network through connections to the Metro Blue and Expo Lines. The Supplemental Alternatives Analysis (SAA) Study will solicit feedback from corridor cities and stakeholders to refine and update alternatives previously identified as part of the Metro Harbor Subdivision Alternatives Analysis (AA) Report prepared in 2009. At the conclusion of the SAA, a new or refined preferred alternative will be recommended to the Metro Board of Directors for consideration. Improve mobility in the South Bay area by introducing reliable and high-frequency transit service options. Enhance the regional transit network by providing more direct connections from South Bay to regional destinations. Provide an alternative mode of transportation for commuters who currently use the congested project study area arterials and I-405 corridor.Improve transit accessibility for residents of communities along the South Bay corridor. Encourage a mode shift to transit, reducing air pollution and greenhouse gas emissions. The project study area encompasses three communities, including the Cities of Lawndale, Redondo Beach, and Torrance.